There was non-stop fun and a celebration of water safety when the mightiest of water “mites” tackled the uShaka Mighty Kids Obstacle Challenge at Wet ‘n Wild on Sunday, March 3rd. On this beautiful day beside the Indian Ocean, uShaka Marine World was transformed into a water wonderland of splashes and squeals as the Addington Primary School’s water babies tried out their new water skills. 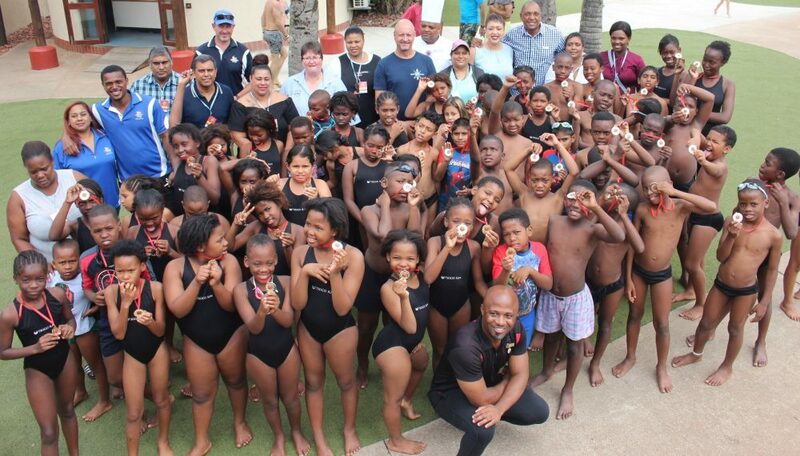 The contestants taking part in the Mighty Kids Finale included youngsters who took part in the uShaka Marine World CSI programme, “Swimanathi”, a swimming programme educating the little ones regarding water safety between 26 January and 2 March this year. This CSI initiative, a partnership between uShaka Marine World, the Princess Charlene Foundation, Tsogo Sun, GeoChem, Lifesaving SA and the eThekwini Department of Sport & Recreation, set out to teach 150 children from uShaka Marine World’s neighbouring Addington Primary School, that fun and water safety go hand in hand. These learners, who come from disadvantaged communities, now know that they can enjoy themselves safely and confidently from the Swimanathi programme. Each child that participated in the Mighty Kid event received a certificate and a medal to take home to show off what they’d achieved to family and friends.